Russia, as other medieval societies in Europe, never excelled in treating women as being equals. Peter the Great’s attempts to haul Russia into the 18th century by force included getting men to start treating women at least as necessary objects to have around the house, not just as servants. Peter issued a “decree on assemblies”, requiring nobles to gather regularly at soirees, balls and salons where they would try to be less boorish by “not taking snuff at tables, not blowing one’s nose like a trumpet”... Women were expected to take part in these assemblies. However this was a rather controversial step, as the introduction of women as part of society rather than appendages to it, was widely seen as an insult to Russian men, and in particular the Old Believers. Women were seen as being even more damaging to society, to them, than the introduction of foreign learning. Be that as it may, in 1764 Catherine the Great, set up the Smolny Institute for Noble Women in St Petersburg, which concentrated on useful social abilities such as music, dancing and French. Catherine reckoned, perhaps because she was a woman herself, that a more open and thus more productive society required informed input from women. She also wished to create a secular civil society as a support for the state, as a counterweight to the powerful Church. Nevertheless, Russian women remained inferior to men. One only has to look at female heroes in Russian literature of the 18th and 19th centuries, for example at Katerina in Ostrovsky’s play, The Storm, at Natalia Rostova and Kitty in Tolstoy’s War and Peace. By the end of the 18th century, only one in a thousand Russians received an education, and only a tiny portion of them were women. Alexander the II relaxed restrictions on what could be taught in Russian universities and the number of students rose significantly. Intake was broadened to allow for students from a variety of non-privileged backgrounds; everyone who was good enough could study. Everyone that is, except women. Things gradually changed, and by the 20th century, the Russian aristocracy felt that to save their skins, they had to catch up with the more liberal and emancipated western Europe. Women were thought of as having some of the rational thought processes that men did. When Nicholas II created the first State Duma in 1906, there were a few women among the deputies. Amongst the peasant communities, voting was, however, carried out by the male head of each household. The lowly position of women was an easy target for the Bolsheviks. Using the alleviation of the oppression of women as an excuse, they tried to eradicate what they promoted as being socially harmful: the “bourgeoisie family”, which they saw as being a stronghold of religion, ignorance and prejudice in the 1920s. Free love was promoted, well before the sexually liberating 1960s in the West, or 1970s-1980s in the Soviet Union, as the Communists set their sights on the elimination of the family as a social unit. Instead, they proclaimed, the state would look after all basic functions. Special blocks of flats, such as the commune building near where the American Embassy is today in Moscow, were built with huge communal canteens and childcare facilities. Liberated from domestic labour, women would now enter the labour force on an equal footing with men. Marriage would be replaced with “free unions of love”. Children were common property, to be “socialised”. To get an idea just how far things went, the Communists even tried to re-engineer Islamic chauvinism towards women. At huge meetings held in Muslim republics on International Women’s Day, starting in 1927, women would demonstratively cast off their veils and throw them into the flames of a bonfire. This, naturally enough, caused strong feelings in the more traditionally minded on-lookers, and being a policeman protecting the newly unveiled was not a popular job. The ideas of free love and communal child-rearing soon went wrong. The divorce rate increased very rapidly and children were abandoned en masse. At the same time, the birth-rate plummeted. This created a serious threat to the functioning of Soviet industry. During the 1930s, Stalin back-tracked and re-introduced the family. It was now OK to have at least a personal life (lichnaya zhizn) but still not a private life (chastnaya zhizn). Amongst all of this, few mentioned that the idea of liberating women had failed abysmally. After a hard shift in the factory, women would come home and face another 4-6 hours of work every evening doing household chores whilst their husbands, no longer bound to traditional male tasks like chopping wood or stoking fires, enjoyed themselves. Statistics show how in 1923-24, working women spent three to four times longer than their husbands doing households chores, and in 1936, this increased to five times. Now marriage became glamorous, especially in one of the new flats that Stalin gave his party apparatchiks as rewards for loyalty. Wedding rings, which had been banned in 1928 as bourgeois Christian relics, were reintroduced. Fees for divorce were raised and homosexuality and abortion were made illegal. 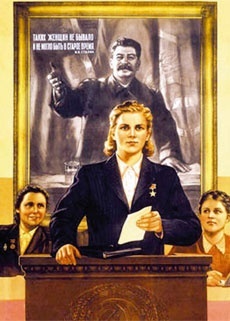 The wives of party cadres now played the role of the traditional homemaker under the good father, Stalin. Officially equal, the Soviet male was of course a superior being, free to leave his wife and child if he got a better job, or just felt like moving on. Women who were promoted, and, though there weren’t very many of them, took on male qualities, becoming as aggressive and decisive as men, if not more so, in order to survive. 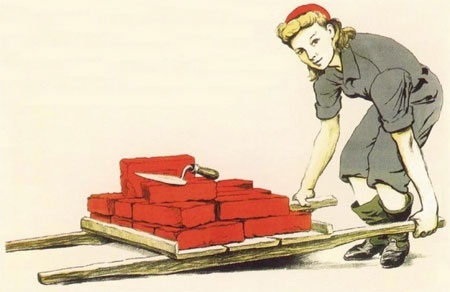 During the war, women made up at least half of the work-force. Food queues ensured that evenings were busy, even if there weren’t so many males around. After the war, there were millions of fatherless children to look after. By then private property was OK again. There was not a lot of private property in those days, but householders held new power, as an urban apartment could now be passed on to the next generation. Since the children of unregistered marriages were excluded from such deals, the legal concept of illegitimacy was reintroduced in the late 1940s. A 1959 census found 663 men between the ages of 35 and 44 for 1000 women. In the 1970s, it was officially calculated that women spent over 27 hours a week on housework; men just 12. Divorce was simplified again in 1965, leading to an increase in the rate to about one third of all families, roughly the same as in America at the time. Since divorce was expensive, many couples preferred to separate. In Russia, the high divorce rate was put down to drunkenness in over half of the cases recorded. In the last three decades of the Soviet Union, salaries for men grew at a faster rate than women’s. This was particularly unfair in the many instances where women were better educated than men. It was harder for women to rise to the top of the teaching and medical professions, for example, than men, although women far outnumbered men in these professions. Higher party ranks were almost entirely male. The question of equality was not discussed. As Geoffrey Hosking mentioned in A History of the Soviet Union, the identikit office- holding party member was elderly, male, Russian (or at least Slav), with experience in party administration, and of course, male. In the late 1970s, feminist protest groups appeared in Leningrad, influenced in part by western ideas. But the movement did not strike a deep root and its leaders were quietly exiled abroad. The West was the new Siberia for dissidents under Brezhnev. Even as late as 1989, 43% of women in industry were engaged in manual tasks as compared to 26% of men. In construction, the figures were even more unfavourable: 74% were female workers, 44% male. Contraceptives were scarcely available in the Soviet Union, and were the subject of terrible jokes. Due to the crudity of manufacture, condoms were known as “galoshes”. In 1980 there were 7 million registered abortions to 4.9 million births, more than one for every ten women aged between 15 and 49. 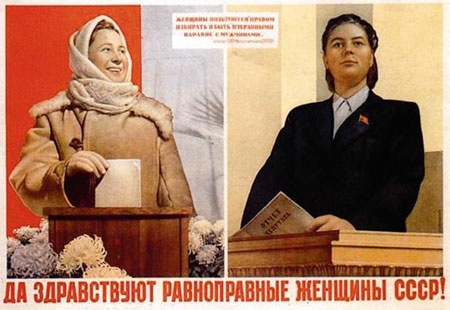 At the same time, the Soviet Union brought many plusses for women. More were educated than ever before. Western ideas could no longer be excluded from conversation. The tides of emancipated thinking sweeping the West were soon to have a major impact on post-Soviet Russia.